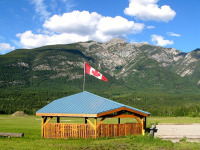 First opened for camping in May 2005, The Golden Eco-Adventure Ranch is a 400 acre riverside property with room to roam and great views of the surrounding Rocky Mountains. It is an ideal base from which to pursue any number of Rocky Mountain tourism and/or adventure activities. One of the many opportunities for visitors to Golden is to stay right in Golden at the campground. Located on the Kicking Horse River, and across the road from Golden's municipal swimming pool, close to tennis courts, hiking and biking trails. Located in the Columbia Valley 44 Km's South of Golden, BC & 59 Km's North of Radium Hot Springs, BC right in the middle of the Rocky Mountains and the Purcell Mountain ranges. 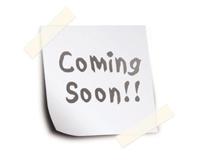 Ask about SEASONAL CAMPING @ the Quinn Creek Campground. We have some people registered and spots are filling up quickly. 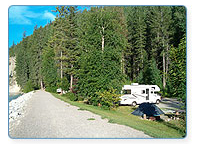 The campground borders the Columbia River and Hwy 95.